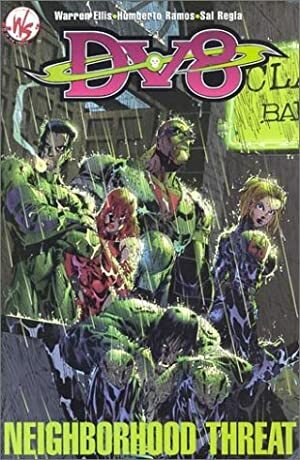 DV8 (pronounced “deviants”) was a 1995 Image Comics series about edgy super-powered kids. Self-centred and self-indulgent, their lives are controlled by a murderous intelligence conspiracy managed by one Ivana Baiul. Though the book’s sales made returns of the characters difficult to obtain, the existing fan base seems to have been quite dedicated. Known Relatives: She comes from a big family, but we don’t know the names of her relatives. Base Of Operations: I.O. Facilities. Freestyle is a Gen-Active 2nd generation. She was given the synthetic Gen-Factor compound that Ivana designed to give powers to her Guinea pigs. Her primary power is that she is impervious to mind control. The attempt will not only fail – it will backfire on the attacker. 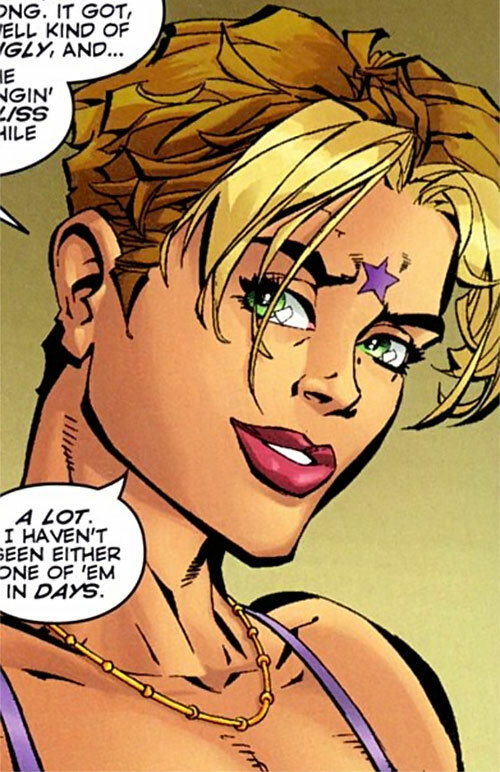 She also has an uncontrolled ability that was believed to affect probabilities. However, this is more like trying all the possible combinations until one works. She has no control over it. The biggest trouble is, it puts such a drain to her body that she immediately ages proportionally to the possible combinations of the action. Fortunately, the aging seems temporary on her. So far she gas been able to fully recover. Before joining I.O., she already was an accomplished gymnast. Jocelyn comes from a large family. Being neither the eldest nor the youngest, she felt she needed to do something great to attract her parents’ attention. As she was naturally agile, she chose to train in gymnastics. An Olympic career would likely have ensued if Ivana hadn’t interfered. Somehow she learned that Davis was immune to controlling powers. Baiul recruited Davis as a hidden asset if Copycat was to go AWOL. Freestyle is the last to have been brought out of her cryogenic pod. When Ivana freed her, she intended to put her back as soon as possible. Baiul was aware that Davis was a potential liability, something of a dead weight in her hit team. The team’s pressure, and then the discovery of her ’probability‘ power convinced her to set her free. She had a short relationship with Evo. During the Slip Stream crossover, she was the only one to notice that the continuum has been modified. Jocelyn even witnessed the substitution between Sublime and Fairchild. A music video model type. Her hair are dark blonde with a light blonde fringe. She has a black five-points star tattooed on the center of her forehead. Freestyle is usually an airhead. She’s oblivious of danger as she’s convinced she could dodge any incoming attack. Well basically they’re a bunch of freaks, thugs and psychopaths (sorry, anti-heroes). So I suppose they’d be dandy as the new group from Mento, after he lost control of the Hybrid. That would make them foes of the Titans, which is quite fitting IMHO. Invulnerability only works against the pet’s aging damage (-6). Mind Blast has No Control (-1), Cannot Enhance (-1) and is only used as counterattack when Iron Will adds to RV (-1), this counterattack does not forfeit her dice action (+1). Pet, Misc: RAP gained against Freestyle from Mind Controlling powers are taken as Mental bashing damages, instead of providing the usual result. Statistical Power [Superspeed: 24, Limits: Superspeed only reduces the time to perform an action where there is a statistical chance of success (like typing the correct code on a keypad, -6), Cell Rot: 12, Limits: Cell Rot only Works on Superspeed’s “user”, only makes an “Aging” attack after any Superspeed’s use, AP of the attack is half of the Superspeed’s AP involved, all in all it’s the equivalent of a 100 HP drawback]. Turning a power into a Pet is occasionally used for those abilities who seem to act on their own, without interfering with the character’s normal actions. It was used first for the Black Cat. This approach is derived from the writeup of a San Angelo character in the Hero game system . Feedback Defense — Immunity 5 (mental entranced/compelled/controlled), Quirk (incurs a Side Effect that the effect is resolved as a Damage Effect instead, but she gets +10 on her defense roll). Backlash — Psychic Damage 8, Reaction (attempts to inflict compelled or controlled mentally), Subtle. 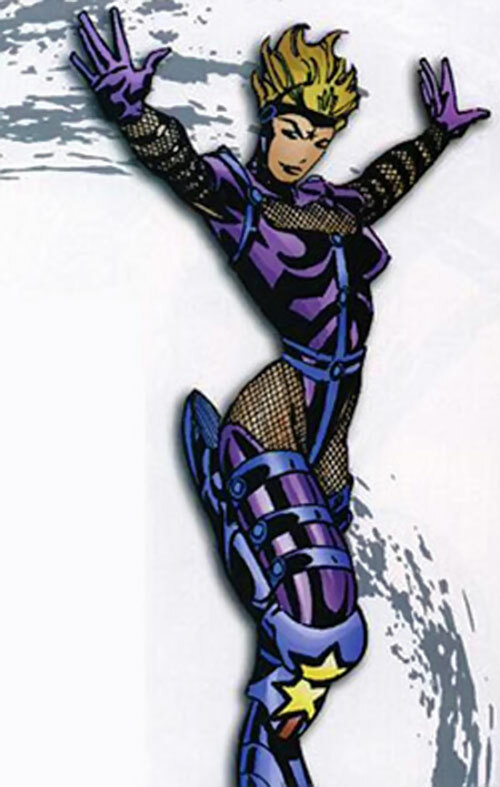 Power Solution — Quickness 24, Limited (only for actions that have multiple choices or possibilities, in order to make multiple attempts), Side Effect 2 (incurs an Affliction resisted by Fortitude equal to half the ranks used, that causes her to be impaired, disabled, then incapacitated), Uncontrolled. Defensive Roll 1, Evasion, Improved Defense. Acrobatics 7 (+13), Athletics 12 (+12), Persuasion 1 (+2). Unwanted Power Jocelyn recognizes she is often dead weight, but that her abilities are valued by others. Trade-off areas. Attack/Effect PL 6, Dodge/Toughness PL 7, Parry/Toughness PL 7, Fort/Will PL 4. Points total 89.Abilities 30, Defences 12, Skills 10, Powers 34, Devices 0, Advantages 3. Equiv. PL 6. Source of Character: Images Comics (Wildstorm Universe). Helper(s): Sébastien Andrivet. M&M game stats by Pawsplay.